Since we have been in Williamsburg many times before, we didn't feel compelled to do a lot of sightseeing and were hoping to continue our slower pace. We were in Williamsburg twice last year (once in July with Lora and J. Michael right before we went full-time and again in early November). So this time, we didn't even buy tickets to the restored area. We love the restored area, but we didn't need to see any of the buildings and exhibits on this trip. 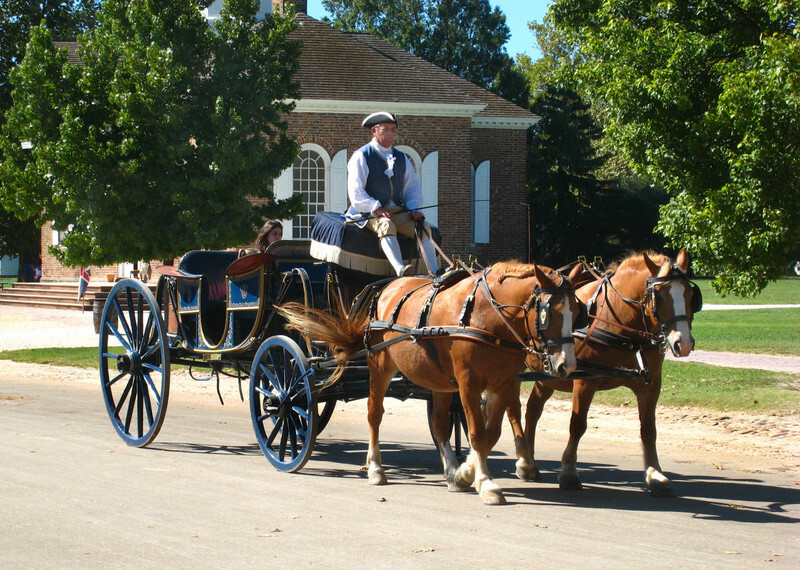 At this point in time, we're happy to just sit on a bench for a while along Duke of Gloucester Street and watch the Colonials walk by and the carriages going up and down the street. Occasionally, someone in costume will slip out of one of the buildings and sit on a bench and play a penny whistle, recorder, or guitar. We even unloaded our bikes and rode in the restored area. There are more photos of the restored area in Photo Album 023: Williamsburg. When we were in the area last fall, we went to Jamestown. This year, we decided to go to Yorktown. Williamsburg, Jamestown, and Yorktown are known as the Historic Triangle and are very important to America's colonial history. Jamestown, founded in 1607, was the first successful English settlement in the New World and thus was the start of the American colonial period. Although the Spanish had been in the New World about a century by the time the English got here, we Americans trace our origins back to the English. 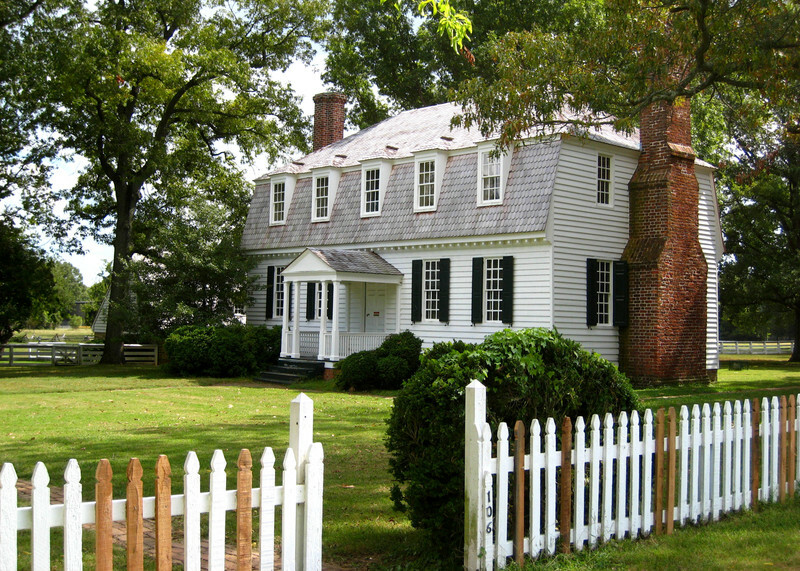 Williamsburg, which was originally called Middle Plantation, was renamed after the capitol of the Virginia Colony was moved there from Jamestown in 1698. 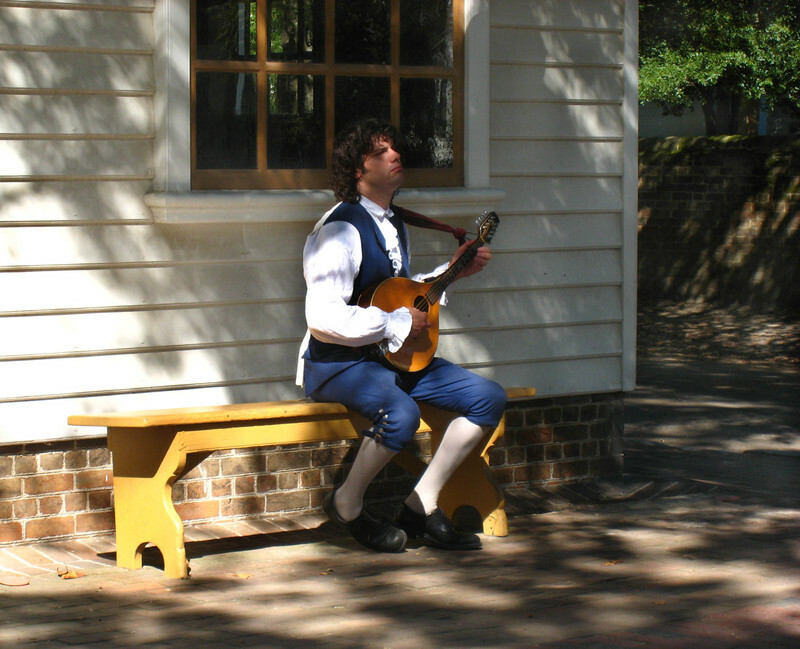 As the capitol of the colony, Williamsburg became a cultural, commercial, and political hub. Williamsburg, along with cities to the north such as Boston and Philadelphia, was an important center for developments leading to the American Revolution. Patrick Henry (famous for his "Give me liberty or give me death" speech) was from Virginia and sat in the House of Burgesses in Williamsburg. Yorktown was the site of the last major battle of the American Revolution where British General Cornwallis surrendered to General George Washington in 1781. Even though the armistice wasn't signed for another 2 years, the American victory at Yorktown assured our independence and marked the end of the colonial period. ...as well as a small beach. 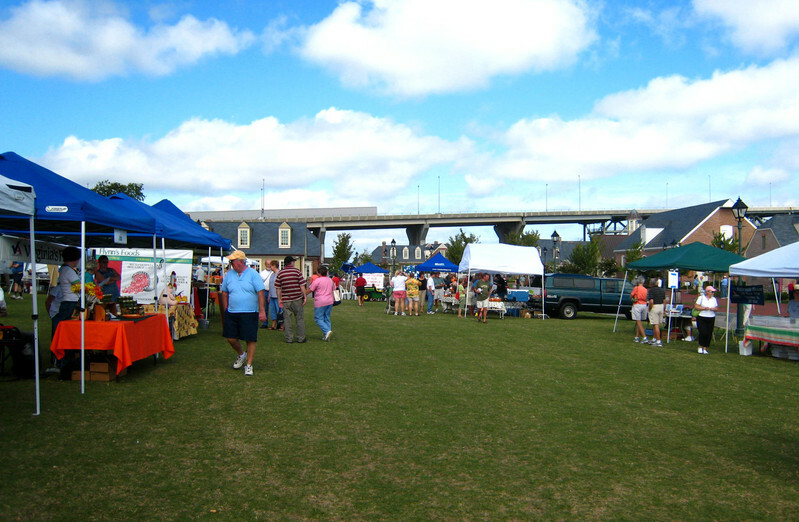 Twice a month June through September and once a month October through December they have Market Days, which is primarily a farmers' market where vendors sell fresh produce, seafood, plants and flowers, handmade soaps, and art. Although the market was the primary reason we went to Yorktown, we were pleasantly surprised how much there was to do and see. 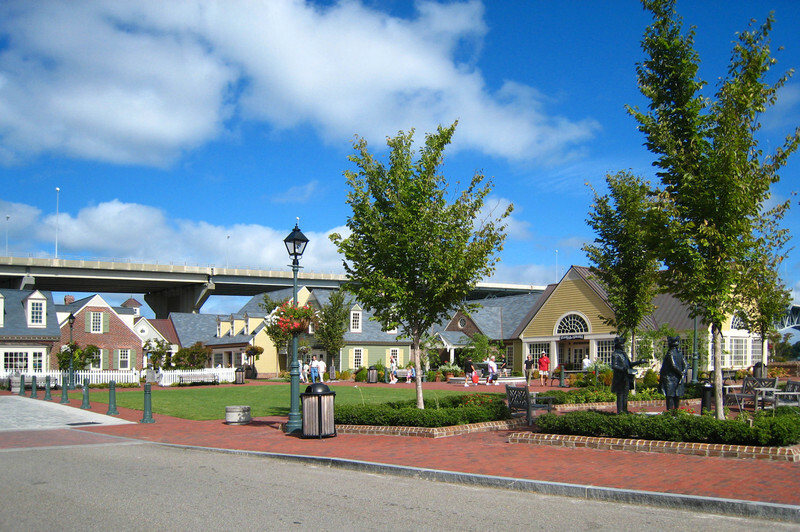 There are a several historic buildings, although much of the town was destroyed during the siege in 1781, by a fire in 1814, and during the Civil War. There is also the Watermen's Museum, the Yorktown Victory Center, and Yorktown Battlefield. 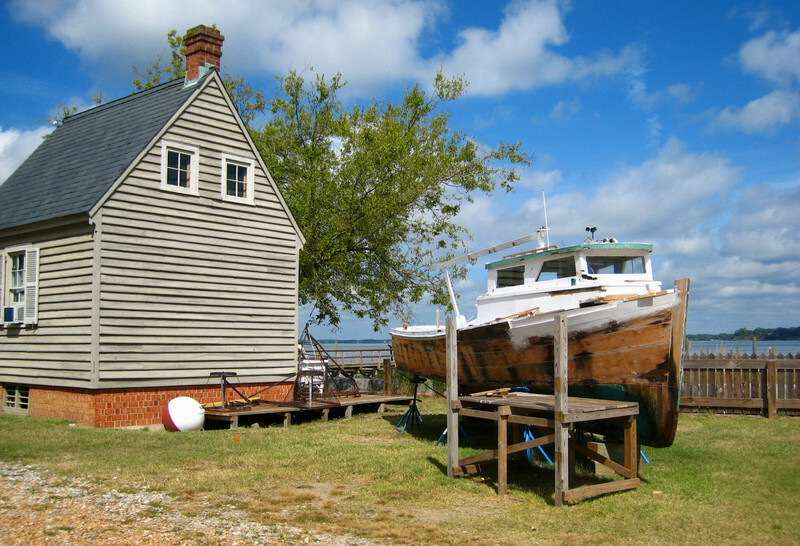 The photo below is a type of boat called a deadrise they were restoring on the grounds of the Watermen's Museum. The deadrise is popular in the Chesapeak Bay area because it can operate nearly everywhere on the bay for crabbing, oystering, and fishing. We also learned that Yorktown was the place where the Olympic flame first arrived in America on January 31, 1980, on its way to the Winter Games. While we were in Yorktown, we decided to visit the battlefield, which is part of the National Park Service. As usual, there is an excellent introductory movie that gives a lot of background information. There is a small museum with some of George Washington's military tents and General Cornwallis' campaign table as well as some other artifacts. There are ranger-guided walking tours of the battlefield, but we opted for the self-guided driving tour. The driving tour takes you past original and reconstructed earthworks and siege lines and includes a stop at the Moore House where the terms of surrender were negotiated on October 17, 1781. For us, no trip to Williamsburg would be complete without a visit to the Williamsburg Pottery, especially since we were staying in their campground. The pottery was founded in 1938 by William E. Maloney to make reproduction colonial saltglaze pottery for sale at low prices. This was about the same time that John D. Rockefeller was completing the initial restoration of historic Williamsburg. In time, Maloney added discounted china and glassware to keep customers coming back. The business mushroomed into major area attraction with 32 buildings covering 200 acres. They carry a variety of items - imports, closeouts, seconds, and first quality merchandise that include silk and dried flowers, glassware and china, woodenware, stone sculptures, concrete lawn ornaments, rugs, baskets, live plants, and much more. And, yes, they still make the saltglaze pottery on site. Over the years, the pottery has changed some. Gone are the huge crowds that were there when we first found the place in the early 70s. Back then, there weren't many places to find the type of merchandise and the prices the Pottery had so people flocked there looking for bargains. Now that almost everything we buy is imported and there are discount stores like Wal-Mart and places like Prime Outlets, the popularity of the Pottery has waned somewhat. But it's still a fun place to go and look around. You never know what they might have that you didn't know you needed. Another "must" stop for us in Williamsburg is Pierce's Pitt Barbecue. Pierce's has been voted one of the south's best barbecues three times by readers of Southern Living magazine. Pierce's was started in 1971 by Julius "Doc" Pierce who brought his mother's secret sauce recipe from Tennessee to Virginia. We like our barbecues "with," which means served with coleslaw on top of the meat. The slightly sweet coleslaw is a nice compliment to the vinegar-based barbecue sauce. In case you're wondering why the name has two "t's" in the word "Pitt," when the first sign was delivered it was incorrect. The sign maker reportedly wanted to charge Doc $25 to fix it, but the budget was so tight Doc couldn't afford it and the second "t" stayed. The restaurant is on the original site and the original building still stands, although it is unrecognizable because it is surrounded by additions. Pierce's is a little hard to find, but it is well worth the search. Today, there are a number of signs leading the way and if you still can't find it, just ask a local. One of the best signs of a good, inexpensive restaurant is that locals go there. 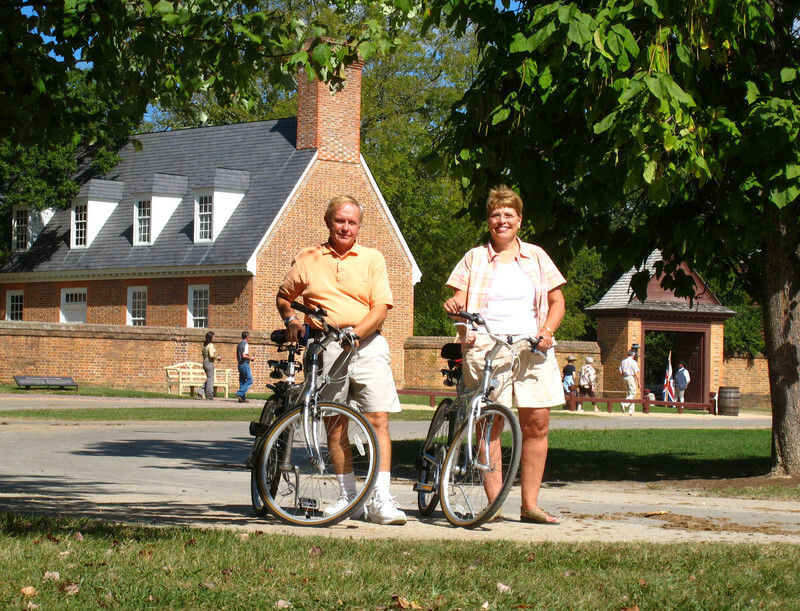 A number of years ago on one of our many previous trips to the Williamsburg area, we took a cruise of nearby Hampton Roads. At that time, we opted for a cruise aboard a sailboat. The sailboat cruise didn't include the Norfolk Naval Base, so we always felt we missed out on something important. So on this trip, we decided to take a cruise aboard the Miss Hampton II. 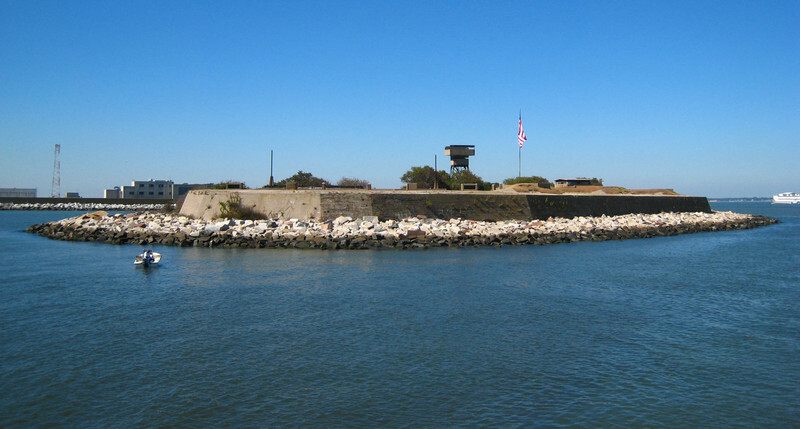 The cruise included not only the harbor, but also the Naval Station Norfolk plus a stop at Fort Wool, an island fort accessible only by boat. The young man who was the tour guide for the cruise was excellent. He had so many interesting facts about the ships at the naval base and so much information about the harbor, the Chesepeake Bay, and the history of the area! 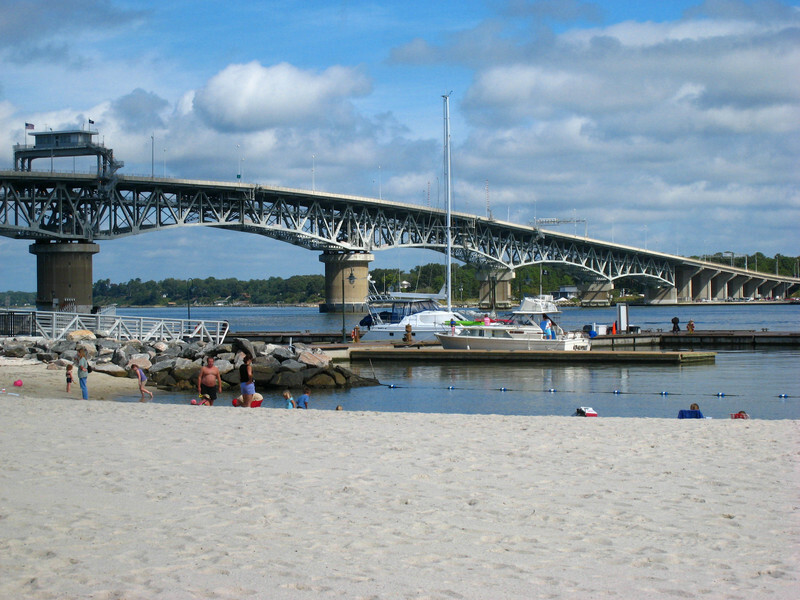 Hampton Roads is both the name of the harbor area and the land that surrounds the harbor and including cities such as Hampton, Norfolk, Virginia Beach, and Newport News. The name "Hampton" honors one of the founders of the Virginia Company of London (which sent the first settlers) who was the 3rd Earl of Southampton. The name "roads" comes from roadstead, which is an old nautical term meaning a place outside a harbor where ships can lie at anchor. Hampton Roads is at the southern end of the Chesapeake Bay. The Chesapeake Bay is approximately 195 miles long and 35 miles wide and is an estuary into which 48 major and 92 minor rivers flow. Five of those rivers converge at Hampton Roads. The headwaters are in Cooperstown, New York. The area is rich in history from the earliest colonial times. We passed by the spot where the original Jamestown settlers first landed in 1607. Because the settlers were unable to find a suitable water source, they sailed farther southwest and then up the James River to the site that would become Jamestown. Incidentally, the landing date of 1607 means Jamestown is celebrating its 400th anniversary this year. Edward Teach, better known as Blackbeard, (a great National Geographic Kids link) was a notorious pirate who plundered merchant ships in this area (as well as in the Carolinas and the Caribbean) in the early 18th century. Blackbeard was killed and his head was displayed on a pole in the Hampton Roads area in 1718. Interestingly, his reign of terror lasted only two years which didn't seem like a very long time for the notoriety he holds. The battle between the first iron-clad ships, the Monitor and the Merrimack took place at Hampton Roads on March 9, 1862. The Merrimack, which is more correctly called the CSS Virginia, was built on the burned out hull of a Union ship, the USS Merrimack by the Confederates. The Confederates rechristened the ship the Virginia. During the battle, the two ships pounded each other for hours, mostly at close range; but neither was able to inflict serious damage on the other and the battle ended in a stalemate. Two months later in May, 1862 the Confederates left the Norfolk area due to developments on land. They knew they would not be able to get the Virginia past the fleet of Union warships, so they deliberately ran the Virginia aground and set her on fire to prevent her from being captured. In December, 1862, the Monitor sank in bad weather off Cape Hatteras while under tow to Beaufort, North Carolina. Although neither ship lasted long, the iron-clads spelled the end of the wooden warship. Speaking of warships, the Norfolk Naval Base was very impressive. The base covers 3,200 acres and is the world's largest naval base. Approximately 75 to 80 ships call this their home port. Of all the ships, the aircraft carriers are the most awesome. 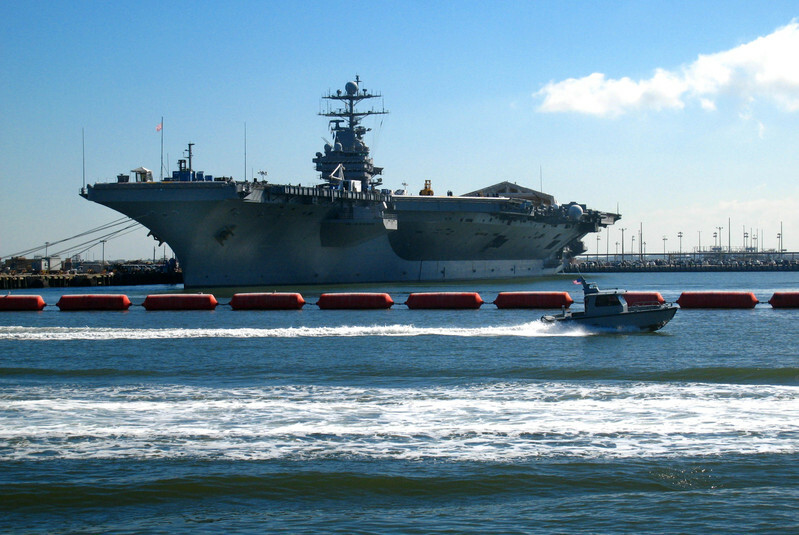 When we were there, the USS Harry S. Truman was in port. The Harry S. Truman is a Nimitz-class nuclear supercarrier. She is 1,092 feet long, 252 feet wide, and 20 stories tall. She carries approximately 90 fixed-wing aircraft and helicopters. There is a crew of 3,200 with an air wing of 2,480. The Harry S. Truman has a top speed of over 30 knots (56+ mph). Notice the wake of a patrol boat that had just passed by in the foreground and another patrol boat to the right in the photo of the Harry S. Truman below. The base is very well protected. Also in port were numerous amphibious assault ships, guided missile destroyers, frigates, and submarines. We were very impressed by the facilities at Norfolk and by the tremendous might and power of our military. We thank all those military personnel, past and present, who have sacrificed so much that we might live in freedom. On our way to Williamsburg a few days prior to our cruise, we crossed the Chesapeake Bay by way of the Chesapeake Bay Bridge Tunnel. Here in the southern part of the bay there are several other bridge/tunnel complexes. The reason tunnels are used instead of bridges is because of the naval base. If we were attacked, our navy could be trapped in port by a downed bridge. On the way back to the dock, the cruise made a stop at Fort Wool, which was constructed on a man-made island. Work on the island was started in 1818. Construction of the fort was started in 1826; but the fort was still incomplete at the start of the Civil War because the island, which was essentially a pile of rock in the water, was still settling. The fort was used through WWII with the addition of anti-aircraft searchlights and radar. For more photos and information about our harbor cruise, please see Photo Album 023: Williamsburg. To the south of Williamsburg across the James River in an area known as Scotland lie Surry and Isle of Wight Counties. The real fun part of the trip across the James is the ride on the Jamsetown Ferry. 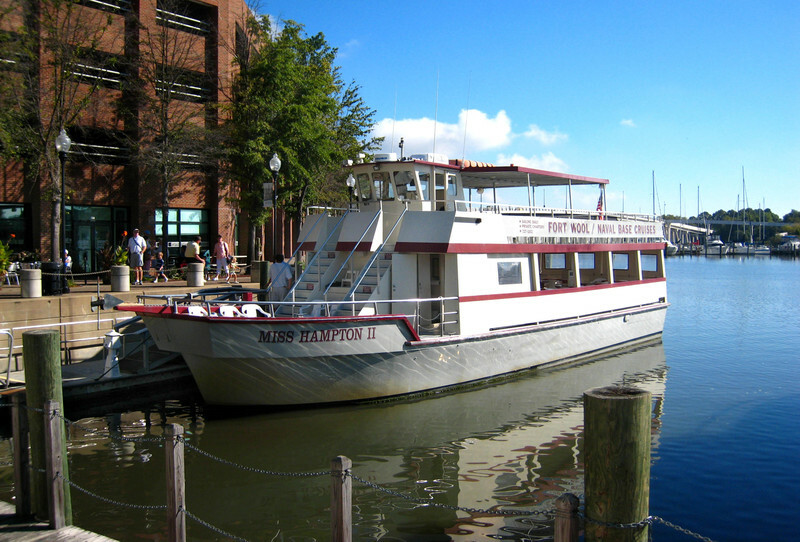 The ferry is operated by the Virginia Department of Transportation and is free. 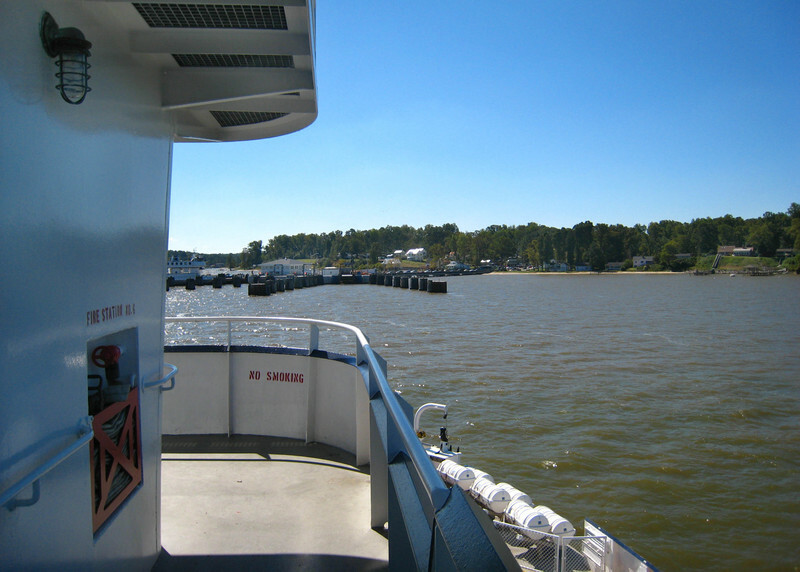 The photo below shows the view from the upper deck of the ferry as it approaches the south shore of the James River. The town of Surrey was settled shortly after Jamestown across the river when a fort was built on the south banks in 1609. Isle of Wight County was established in 1634 and Surry County broke away from James City County in 1652. The town of Smithfield was established on the banks of the Pagan River in 1752 and is the home of Smithfield Ham. 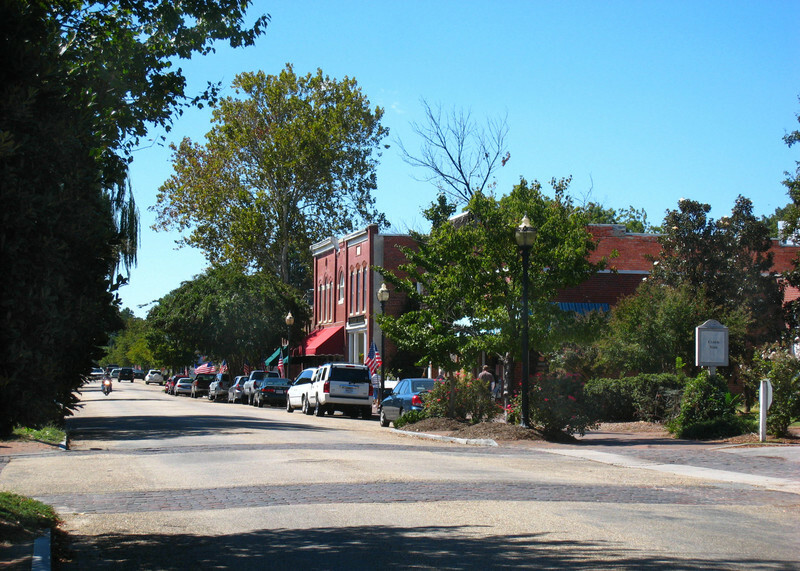 Many of the towns on the south banks of the James River have quaint historic districts. Here is a view of historic Smithfield. There are more photos and information about out ferry trip to Surry and Smithfield in Photo Album 023: Williamsburg. Although we intended to continue our slower pace, we did see quite a bit while in the Williamsburg area. Since we were there for 10 days, we didn't feel rushed.